The baobab is one of nature's oldest and oddest trees. Capable of living for thousands of years, this deciduous tree has a peculiar growth structure consisting of a massive, bottle-shaped trunk and relatively sparse canopy. Native to Madagascar, Africa, and Australia, the baobab grows in tropical and semi-tropical climates experiencing little or no freezing temperatures. 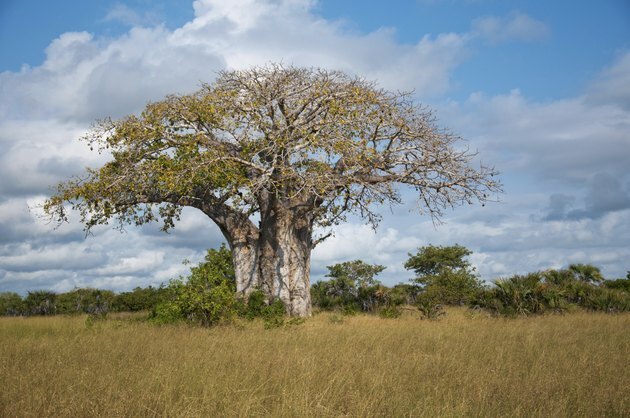 Considered a sacred "tree of life" in Africa, the baobab is featured in Walt Disney's "The Lion King." 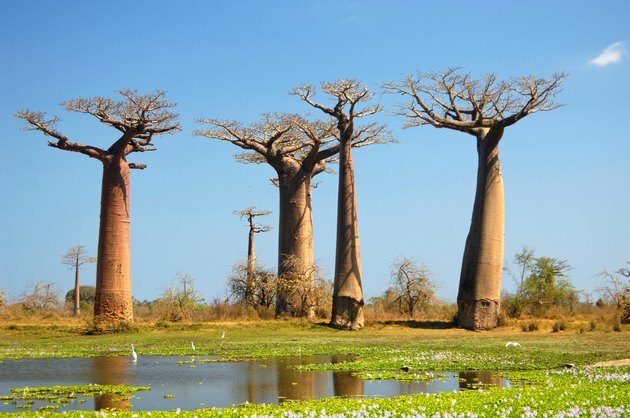 Baobab (Adansonia digitata) is a tree consisting of nine species native to the dry, hot savannas of Australia, Africa and the island of Madagascar. The tree grows 40 to 75 feet tall and has a trunk measuring 35 to 60 feet in diameter. 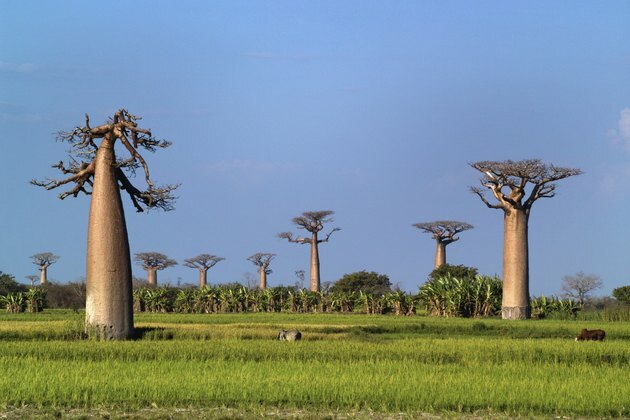 Radiocarbon dating computes the age of some baobabs as being more than 2,000 years old. Baobab trees begin flowering at 20 years of age, becoming covered in midsummer with saucer-sized white, crinkly blossoms with puffy, purple stamens. Emitting a strong, musky odor at night, the blooms attract fruit bats and various insects. The seeds are located in pods, and the resulting fruit is gray, hairy and gourd-like, resembling hanging rats. 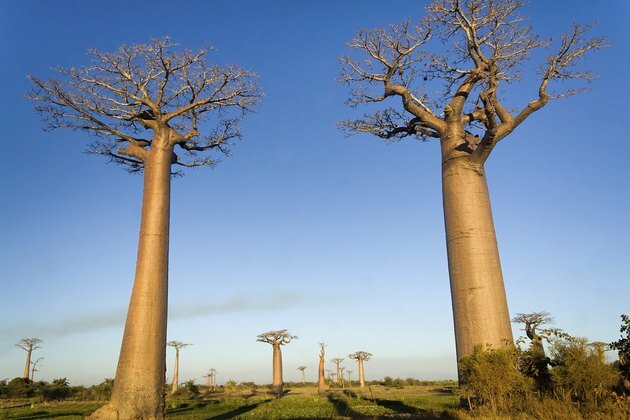 The baobab's thick trunk is soft and fleshy and often filled with hollows, making the tree home to a wide variety of animals, including various birds, lizards, squirrels, tree frogs, snakes, scorpions, spiders and insects. The tree's cavities are large enough to hold humans. Missionary explorer David Livingstone described in a report a baobab whose hollow trunk housed 20 to 30 men. Another baobab served as the town jail in Queensland, Australia. 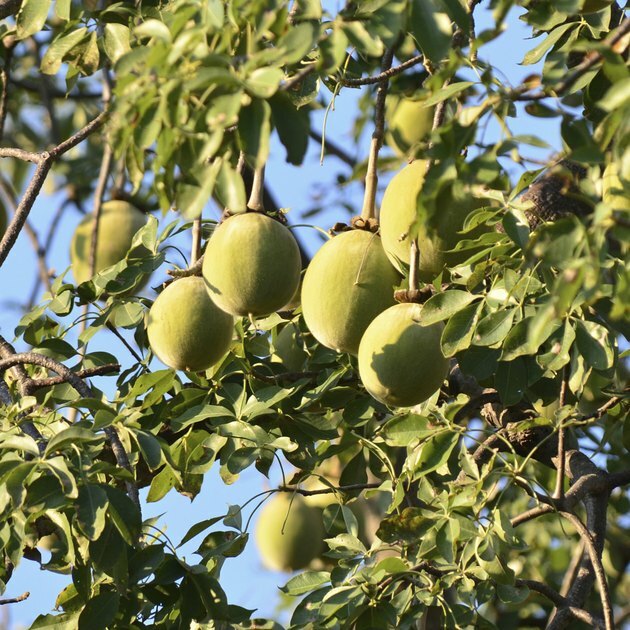 Baobab is grown as a specimen tree in parks and used as a street tree throughout tropical areas of the world, such as India and South America. 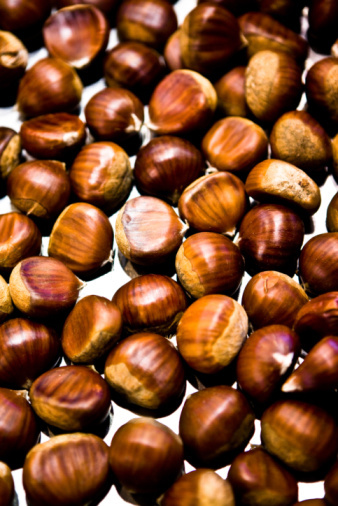 In its native lands, all parts of the unusual tree are used. In Africa, the pulp is made into a lemonade-like drink, the vitamin-C rich leaves are eaten, and the roots are cooked and eaten or used to make red dye. The tree's inner bark provides a strong fiber used to make rope, clothing and musical instrument string. Canoes are also carved out of the tree's trunk. 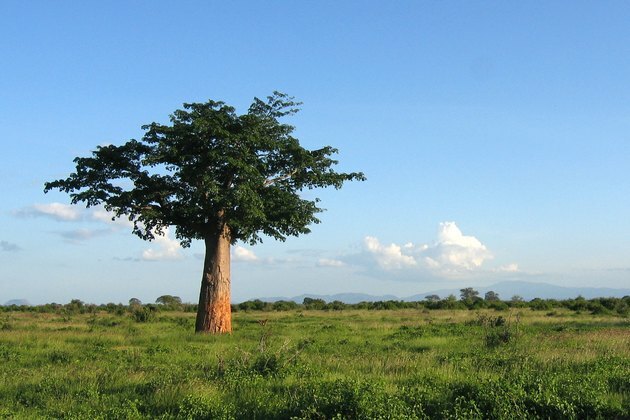 The baobab tree requires a full-sun location with plenty of room to grow. 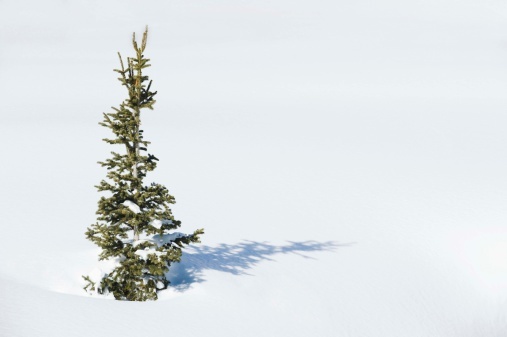 The drought-tolerant tree needs good drainage to thrive. Avoid watering baobab during rainy times of the year. Legend has it that the baobab tree looks like it does because the devil yanked the tree out of the ground and shoved it back into the earth upside down, leaving the tree's roots sticking up in the air, according to William Chaney of Purdue University.